First the shoes. Near the local supermarket is a shop with a few shoes on display. I picked one of them up, a pink Skecher. Cousin swears by Skechers, but I have never had a pair. The shoe was as light as air. I was suddenly, and immediately, seized with the absolute need to acquire a pair. What could be better for sightseeing? On Monday we went in search. We failed. New stock is coming in, but no Skechers in the right size and style for me. Disappointment ballooned above me. But then the assistant produced a pair of equally lightweight shoes of another make, New Balance. Bingo. I have only removed them to sleep in two days. So now the toilets. Earlier in the year, Lyn, who as I believe I have mentioned before is the most organised person in the planet, sent me a list of places she thought I might like to visit on our trip to the north end of the North Island. I clicked on the the link to Hundertwasser and was amazed. An Austrian, he came to live in Kawakawa and made this outstanding contribution to the town. A stone’s throw from the Southbank (well, if you outstandingly good at stonethrowing anyway) is St John’s church. It’s an elegant building, with a graceful spire. In the surrounding garden yesterday evening, I saw a couple arrive and set out a picnic supper on the grass, enjoying the warm sunshine. I sat for a few minutes on a comfortable bench before heading home. But when the sun goes down, the scene changes outside this beautiful church. Homeless people gather and vans arrive with volunteers serving food. 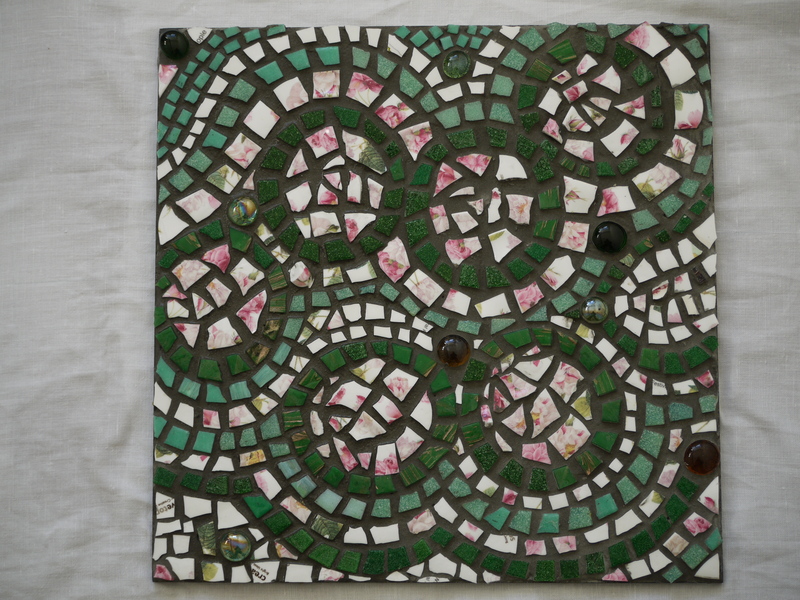 The church is also the headquarters of Southbank Mosaics, an outfit begun by ex-teacher David Tootill, dedicated to beautifying ugly areas, and the garden is full of examples of its work. I have started to look at my books to begin a cull. I don’t know where I got the hoarding gene from, but it wasn’t Mother. She loved to throw things out. I learned this to my cost many many times. I’d return from university to find, or rather not find, my clothes ‘reorganised’. When pressed, Mother would look wide-eyed and say she didn’t know where they were. She probably calmed her conscience with the reflection that by the time I discovered my losses – my black polo neck jumper, patched at the elbows with leather, unravelling at the cuffs and waist, and so old it was almost an antique, stands out in my mind – she would not have known. Papers I had carefully stored, letters, notebooks, old diaries; privacy was no match for Mother’s clearing zeal. 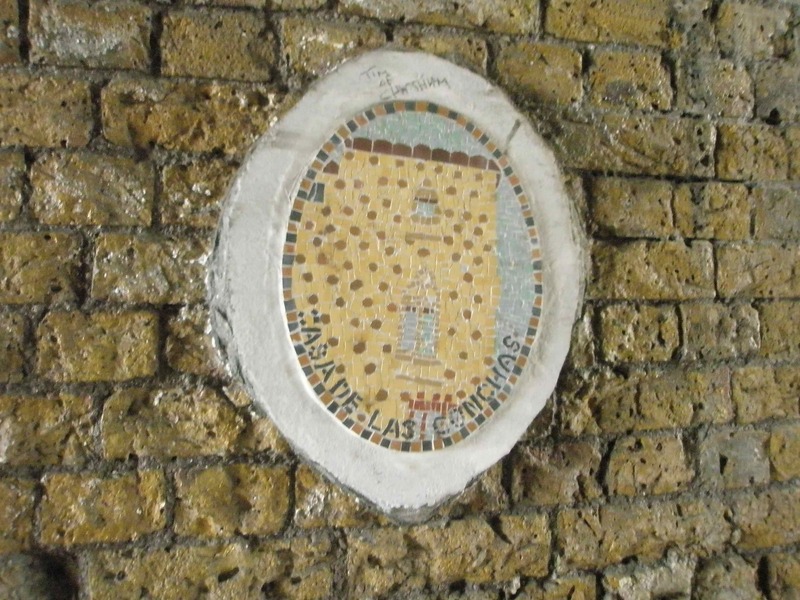 A dingy section of street under a Victorian railway arch is not the most likely place to find mosaics, let alone mosaics of important buildings in Spanish town complete with graffiti. 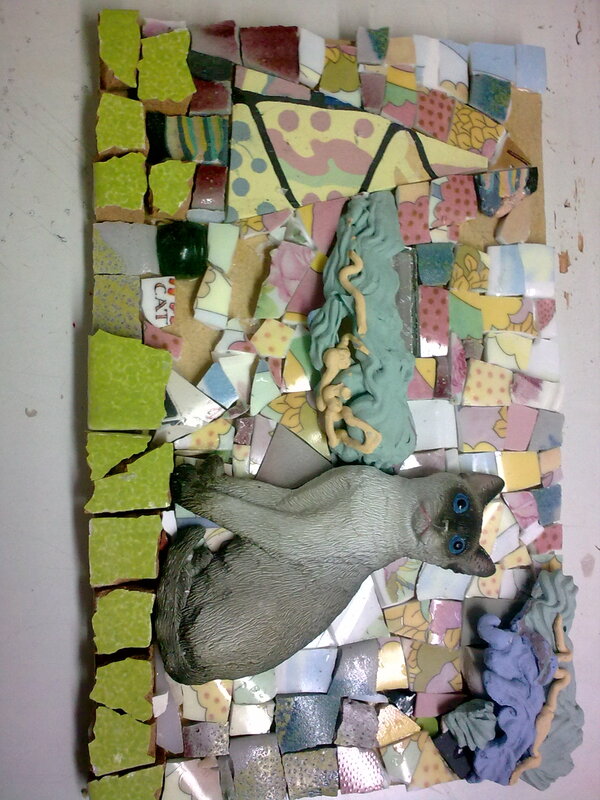 I have nearly finished my latest postcard mosaic. It is a bit kitsch, but I like it. 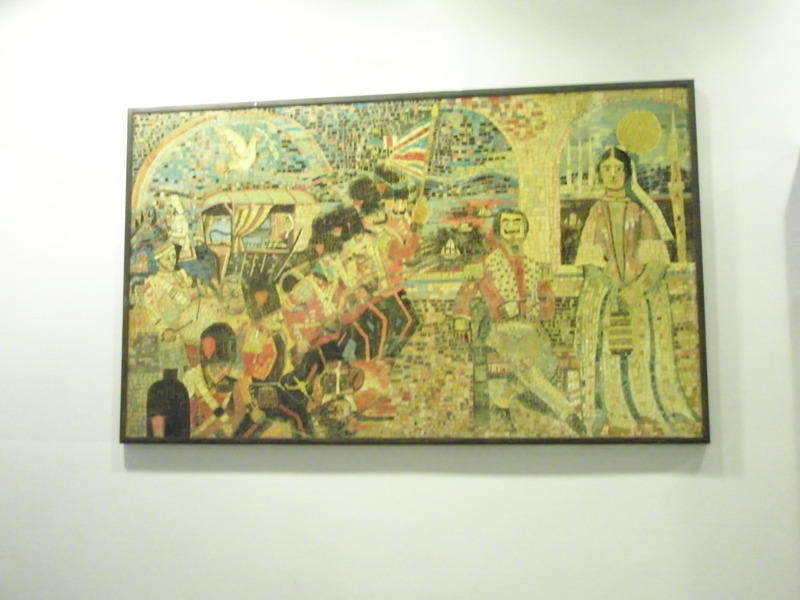 At the gloomy end of a ground floor corridor in St Thomas’ Hospital, London, hangs this paper mosaic. I gave my friends their present. I told them that if they did not like it, that would be fine. I would prefer them to refuse it rather than accept it and wonder what on earth to do with it. But they really like it. Some more pix on this prompt. I find it interesting how many of us associate water with peacefulness, though the photograph with the prompt didn’t strike me as peaceful. 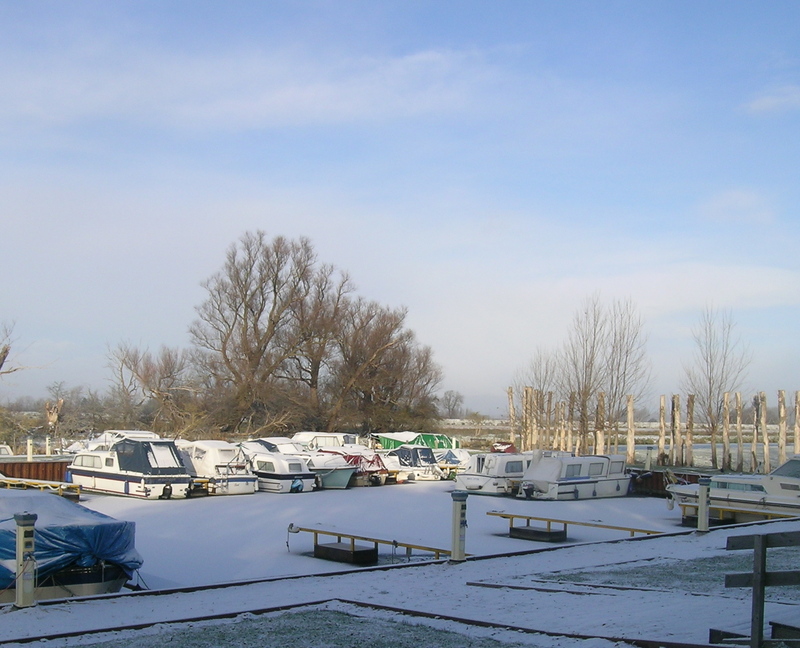 So, to kick off, here is the marina under snow last winter. When there is no one about, the marina is the most peaceful spot I know. I feel my breathing change when I am there. 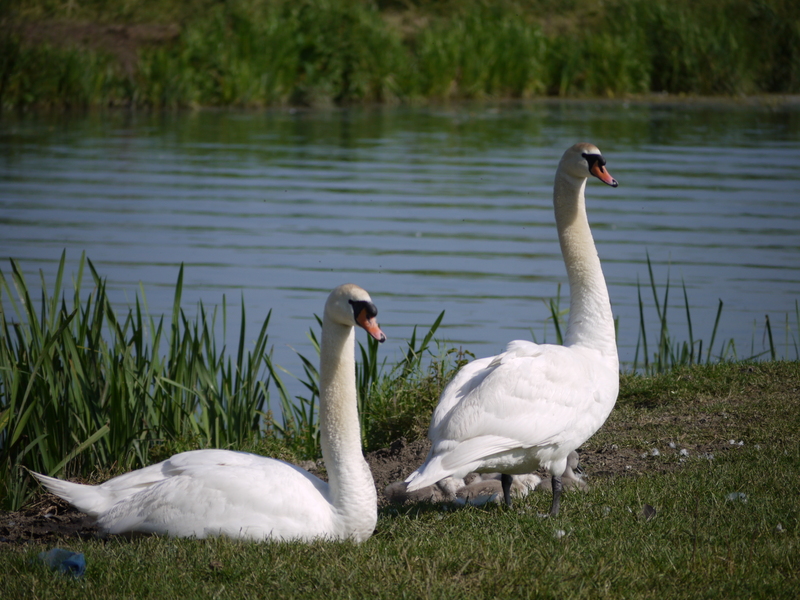 Summer this time, still at the marina, and the swan parents have a new brood.